Speaking at the 34th Centralia Swine Research Update on Wednesday, Dr. Lisa Becton, Director of Swine Health and Information with the US National Pork Board highlighted their efforts to be better prepared when the next health threat emerges. Lessons learned from their experiences with PED helped determine their strategy. The US was not well prepared for PED. In 2014 the NPPC produced a resolution for a plan of coordination and preparedness for the US Swine Industry in the event of the identification/introduction of any new economically significant but non-reportable swine disease. It’s now recognized that industry needs to take enhanced responsibility for non-regulatory diseases. The US Pork Board is playing a key role in improving the industry’s readiness for emerging diseases. She described an approach to improving preparedness in three main areas: a Response Plan including a coordinated state-federal-industry response; a Swine Matrix Project to identify potentially important diseases globally and have information about them in hand or knowledge gaps identified, and to improve diagnostics and surveillance systems; and improved swine information sharing, including the creation of a new Swine Health and Information Center. The Proceedings of the Centralia Swine Research Update are now available online. It includes summaries of all presentations on pain control, nutrition, health, and many written updates on a wide range of topics. On Wednesday January 28th the 34th annual Centralia Swine Research Update will be held at the Kirkton-Woodham Community Centre in Kirkton. This year the feature speaker is Dr. Lisa Becton, Director, Swine Health Information and Research, US National Pork Board. Dr. Becton will be speaking on Preparing For The Next Emerging Disease / Lessons Learned From PED. Dr. Becton will also provide an update on PED cases occurring across the US, and review research they have conducted on feed, manure and other areas. To round out the program, Ontario researchers and graduate students will cover topics on Zinc & Anti-Microbial Resistance, Dynamics of Nitrogen Retention in Gestating Sows, Improving sow productivity through genetics and genomics, Pain Control in Pigs, Swine influenza in nursery pigs and more. The Centralia Swine Research Update was initiated in 1982 by staff at Centralia College to bring researchers and their work together with participants in the pork industry. The event continues to be planned and executed by a committee of industry partners, with support from OMAFRA staff. Its success over the past three decades is due to the quality and timeliness of the program, and the participation of local researchers and experts, as well as experts brought in from other parts of Canada or the US. Registration is $20 if you’re a producer or a student, or $40 for industry reps and includes refreshments, hot pork meal and proceedings. Registration deadline is Friday Jan 23. For more information visit www.centraliaswineresearch.ca or phone 519 271- 0119. Hope to see you at the Centralia Swine Research Update on Jan 28 in Kirkton. Dr. Lisa Becton, Director of Swine Health Information and Research with the US National Pork Board will address “Preparing for the Next Emerging Disease/Lessons Learned from PED”, and provide an update on PED research. Wednesday, January 28th, 2015, Kirkton-Woodham Community Centre, Registration at 9:15am, Program 9:50-3:30pm. There are also many other topics on the program including enrichment for pigs, pain control, iron requirements of piglets, and more. And even more in written reports included in the Proceedings. Registration is $20 for producers and students ($40 for industry) and includes refreshments and a hot lunch. Registration is required by January 23rd, 2015. The full program and flyer with registration information have just been posted at www.centraliaswineresearch.ca. Thirteen years of past Proceedings are available on the website. An updated program for the 33rd Centralia Swine Research Update (Kirkton ON, January 29) has been posted at http://www.centraliaswineresearch.ca. The Centralia Swine Research Update was initiated in 1982 by staff at Centralia College to bring researchers and their work together with participants in the pork industry. The event continues to be planned and executed by a committee of industry partners, with support from staff at OMAF and MRA. It’s success over the past three decades is due to the quality and timeliness of the program and the participation of local researchers and experts, as well as experts brought in from other regions. This year’s program is a great example, with Dr. Yolande Seddon from the Prairie Swine Centre in Saskatchewan visiting to speak on ‘Sow Lameness, Being Aware and Taking Action’ and other topics related to sow management. Dr. Mike DeGroot, a veterinarian with Ontario Pork, will give us an update on the very important topic of PED (Porcine Epidemic Diarrhea), a disease that’s causing a lot of trouble in the US and which we are working hard to keep out of Canada. Dr. Kees de Lange from the University of Guelph will talk about ‘Entire Males for Commercial Pork Production’. Frank Wood from Conestoga Meat Packers will address hernias from a processor’s perspective. To round out the program, researchers and graduate students will cover in-transit losses, antimicrobial resistance, rodenticide ingestion, genetic resistance to disease, benchmarking, anorexic piglets, and the impact of nursery diets on piglet immune response. Besides summaries of these topics, the proceedings from the meeting will contain many written contributions covering current research and industry issues. All this and a hot lunch is available for $20 if you’re a producer or a student, or $40 for industry reps. The registration deadline is January 24th. To register, email or telephone Carrie Parsons at carrie.parsons@ontario.ca or (519) 271-0119. Registration and coffee starts at 9:15; the program runs from 9:50am to 3:15pm. Visit the website for the full program, past proceedings, and other information: http://www.centraliaswineresearch.ca. 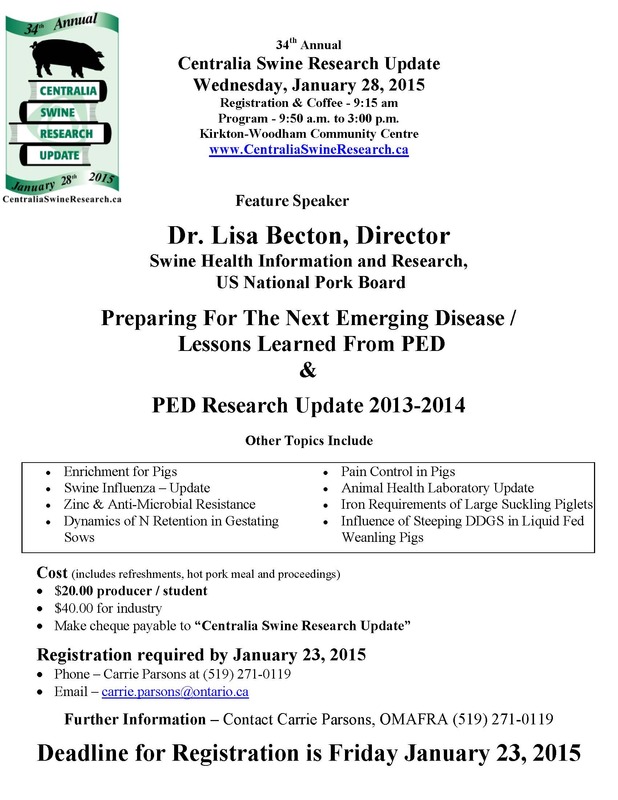 Hold Wednesday, January 29th, 2014 for the 33rd Annual Centralia Swine Research Update in Kirkton. Centralia Swine Research Update aims to bring recent research results and practical information to the Ontario pork industry. Also, a PED Update and many other topics will be on the agenda. Follow http://www.CentraliaSwineResearch.ca for full program details and registration information, coming soon. A great program, a great lunch, and a great networking opportunity all in one. Past proceedings of this meeting are available on the website.